The Beauty of Life: Introducing the First Aid Beauty Dual Repair Collection, Plus a Giveaway! Introducing the First Aid Beauty Dual Repair Collection, Plus a Giveaway! Recently, I told all of you that I was selected as the first-ever brand ambassador for skincare line First Aid Beauty. And, in my first post, I mentioned that you should stay tuned for some very exciting news from the brand. Well, that day is here! Introducing First Aid Beauty Dual Repair. Did you know that in the in the 1940s, prior to World War II, the reported skin sensitivity rates were in the 20-30 percent range for the population? Now, upwards of 70 percent of the population reports having sensitive skin. When skin is sensitive and reactive, it’s usually due to a compromised skin barrier. This upward tick of people reporting sensitive skin was what inspired Lilli to create the products in the Dual Repair collection. Traditional anti aging products bombard the skin with aggressive ingredients that can irritate the skin, especially if you are sensitive, which can actually age the skin with continued use. The “dual” part of the line refers to the blend of both active ingredients that address the signs of aging, such as dull skin, wrinkles and uneven skin tone as well as ingredients that strengthen the skin barrier and reduce skin sensitivity. Dual Repair contains new anti-aging actives that are clinically proven to be effective but safe for even the most sensitive skin. These actives are Astaxanthan (derived from marine micro-algae), SymCalmin (a derivative of oats that reduces inflammation, redness and itching), Argireline (an acetylated hexapeptide that works to reduce wrinkles and redness), Ascorbyl Glucoside (a form of Vitamin C that brightens the skin) and Lana Blue (a blue algae extract that has retinoid-like activity). And, because the skin is fundamentally healthier, the actives’ penetration is even more efficient than before. Dual Repair Face Cream ($44): The anchor of the Dual Repair collection! It moisturizes immediately and also works over time to nourish and rejuvenate the look of the skin. In a 6-week clinical trial, it reduced fine lines by 16 percent, while 88 percent of participants noticed an improvement in skin texture and 81 percent noticed an improvement in the moisture of their skin. After applying the Power Serum (more on that in a moment), I apply no more than a dime-sized amount of this face cream. I love that it freshens and rejuvenates the skin without leaving behind a greasy look and feel. Dual Repair Power Serum ($48): This serum contains concentrated levels of the proprietary blend of key actives that specifically address fine lines and wrinkles – and it’s scientifically proven to reduce them by 41 percent! It’s enhanced with Diacetyl Boldine and Siegesbeckia Extract, which work to calm the skin, tighten pores and improve your overall skin tone. In a 6-week clinical trial, 94 percent of participants noticed an improvement in their skin’s radiance and 97 percent noticed better skin moisture levels. I apply two to three pumps all over my face in the morning before following with the face cream. The texture is slick and extremely easy to apply, and it sinks right into the skin. 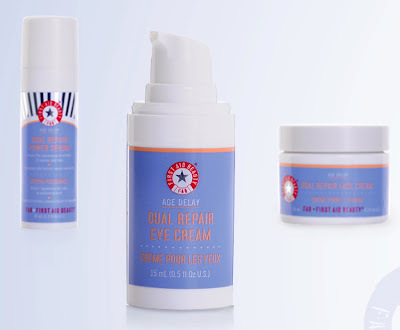 Dual Repair Eye Cream ($40): The proprietary blend of key actives are joined by Sodium Phytate and Glucosyl Hesperidin, which decrease puffiness and dark circles, reduce fine lines, firm and brighten the orbital eye area. One pump is actually enough for both eyes! It’s rich and lush but not greasy, and it doesn’t irritate the under-eye area like some other eye creams. I’ve been applying all three products in the morning before I leave for work for the past few weeks. And would you believe me if I told you the compliments I’ve received on my skin have increased tenfold? Now, here’s the most exciting part. FIVE WINNERS have the chance to receive a full set of the new First Aid Beauty Dual Repair Collection BEFORE it hits Sephora stores in January! This collection has a total retail value of $132. Use the Rafflecopter widget below to enter. This giveaway ends on Friday, January 4 at midnight. FIVE WINNERS will be chosen AT RANDOM on Saturday, January 5. Maximum of FOUR ENTRIES (one for each way listed above). Multiple entries will be disqualified. Giveaway is open to US residents only. I really would love to try the eye cream. It looks like just what the dr. ordered! I would LOVE to try this new FAB line! I've been dying to try FAB products! I love the FAB products. I use the anti-redness serum, aloe and soothing gel and the ultra repair cream daily. This is about the only thing that works on my sensitive skin. Look forward tot he launch of your new products! Havent tried First Aid Beauty products. Wanna win! Love that these products focus on anti-aging. 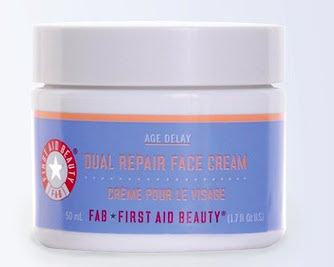 I love that First Aid Beauty Dual Repair focuses on both skin health AND anti-aging! This looks like it would be a miracle for my aging skin! I haven't tried First Aid Beauty products yet, but I look forward to any product that can help with the effects of aging. I would love to try the dual repair cream. I have extremely dry skin. I love FAB and am thrilled about this new line!! I have dry/combination skin and have been patiently waiting for a cream like the Dual Repair!! Thank you FAB, I know I'll love it!! I'd love to try the Dual Repair Eye Cream. The Dual Repair Power Serum!! The “dual” part of the line refers to the blend of both active ingredients that address the signs of aging, such as dull skin, wrinkles and uneven skin tone as well as ingredients that strengthen the skin barrier and reduce skin sensitivity. Dual Repair contains new anti-aging actives that are clinically proven to be effective but safe for even the most sensitive skin - perfect for me! The Dual Repair Eye Cream is calling my name! My favorite thing about this collection is that this is an amazing brand with quality ingredients! Look forward to trying the Dual Repair Eye Cream! I'd love to try the serum. Our whole family has tried the repair cream in the past and loved it! I would love to try this line, I think I would like it most because it helps with redness while also fighting wrinkles! I love that it is made to reduce sensitivity! Can't wait to try the serum. I'd love to try the line because I've loved their current products and would enjoy trying something for anti-aging and brightening! Love that is great for sensitive skin ! I love that these products have concentrated levels of active ingredients. I'd love to try the serum! the dual face repair cream looks amazing! the face repair cream. My face is uber dry! I've been on a near life-long quest for a HG eye cream that can minimize my hereditary dark circles, so I'd love to try theirs. My favorite thing about this collection is that it can increase my skin's level of hydration dramatically and in a short period of time. This really looks like some alright products....It's always so nice to have pre-views...and specials like this...thanks alot!!!!!! for sharing...all three products look very promising!!!!! Safe for sensitive skin! woot! Dual repair cream & eye cream is what I need !!!! My fav thing is the name. I need first aid for my skin! They sound like they all work for somewhat sensitive, finicky skin, like mine! I like the idea of reducing puffiness around my eyes, and calming my skin with the serum. Favorite thing is the hydration factor. Ever since my hysterectomy 2 years ago, my skin has taken on a life of it's own and the things that used to work now don't...especially the hydration factor. My peaches & cream complexion has now turned ruddy and itchy. Bring on the First Aid! I look forward to trying these products out. I'd love to get my fine lines under control. And the puffiness in my eyes is a major problem during the morning hours. Anti-aging products is just what I need. I'm really excited to hopefully win "THE FIRST AID DUAL REPAIR." Their group studies have had amazing results. Thank you! The power serum looks/sounds awesome! My skin is dry and I have a hard time finding a product that provides the moisture I need all day. My favorite thing is that they contain new anti-aging actives that are clinically proven to be effective but safe for even the most sensitive skin. My favorite thing about this collection is that the penetration of the active ingredients is even more efficient than before. I love that it moisturizes *and* reduces fine lines! i am super excited about this giveaway :) i love your review!! my fav thing about these products is all the different functions of the formulas!! Puffy, dark circles are the bane of my existence, so the eye cream sounds like a lifesaver! I already love their other products. Can't wait to try these! Love that they're safe for sensitive skin! My favorite thing about this collection is that it is for sensitive skin too! I would love to try the Dual Power Serum! I would love to give this new line a try!! I love every single item here! I'm getting fine lines on my forehead and around my eyes (plus I'm almost out of eye cream), so I can't wait to give this line a try. I love FAB products. Works wonders on my sensitive skin. Can't wait to try this new line. Thank you! would love to try new skin are products, hope to win! Especially the dual facial repair. I like that it's not greasy. Thanks for the chance. I would love to try the face cream, especially for nighttime - all my products are greasy. i like the power serum!!! I already use their 5-in-1 eye cream and love it - it's so light and easily absorbed. I love the description of the dual repair eye cream because I do usually need a more heavy-duty eye cream in the winter - this would do the trick! I love that the line is not greasy and VERY moisturizing!! Dual Repair Eye Cream has my interest! I would love to try the Dual Repair Face Cream because of its double effects: moisture and rejuvenation. What a great giveaway!I have never tried them but would love too! Love this because as we all age there are products and people out there willing to help us through it all! I like that these products are great for sensitive skin. I love that these don't leave your skin feeling greasy. Hate that! I like that it is safe for sensitive skin.